Guys! Hey, guys! Guess what!? Okay, that’s probably not that difficult a question to answer if you look at the blog post title. 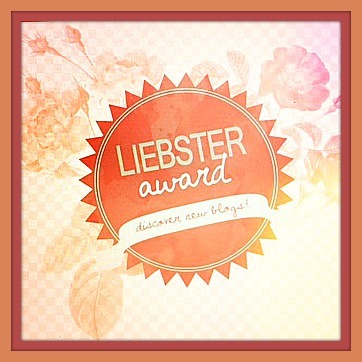 But do you know what the Liebster Award is?! I didn’t. Until I was nominated for it by Valerie! Val is the blogger behind Lifestyle Food Artistry. I assume Val discovered my blog through #SundaySupper. I have enjoyed the Sunday Supper community and now I love it even more! I am very impressed by Valerie. Valerie had the courage to re-evaluate her life and received professional culinary training. Something that I’d love to do some day. She followed her passion and is now a licensed personal chef! My favorite thing about blogging is the amount of support I’ve received from fellow bloggers and this award highlights that aspect of this community. The idea behind this award is a “pay it forward” form of acceptance. There are conditions behind accepting this award – and I happily accept! Not only am I to thank and link back to my nominator (check and check) I am to answer questions posed by my nominator, share 11 random facts about myself, nominate 5 other newer blogs with less than 1000 followers, and create a list of questions for my nominees (I also need to inform them personally of their nomination). When did you decide to start a blog and why? I always picked something new to make for dinner and decided to document my adventures in the kitchen as a distraction from difficulties conceiving our first child. What do you hope to accomplish through your blog? In the land of dream world – to be “discovered” by Food Network! In reality – just to have one person read my blog and enjoy it. Do you find it helpful to read other blogs for inspiration? If so, do you have a favorite? Did you design your blog or did you hire someone to design your site? Neither? I use one of the free layouts on WordPress. What is your best dish to make? Have you ever attended a blogger conference or training? If so, which one(s)? Do you use a professional camera for your photography? I use a Cannon Rebel T5i. What is your favorite photography app? I use Lightroom to edit my photos. What is your best social media platform as far as number of followers and ease of use? If you could give anyone advice on starting a blog, what would you say? Create a separate email address for all blog related correspondence. It’s not a great piece of advice but organization is key! (Optional, but fun!) Name up to 5 random facts about yourself that you think are unique or unusual. I played violin from 4th – 11th grade. I am a recorded artist; sure it’s a CD my high school created but hey, I’m on an iPod. I play Candy Crush way too much. I am still waiting for my letter to Hogwarts. I can eat a large popcorn at the movies… by myself. I have a very irrational fear of Palmetto roaches. I love playing board games and cards; if I’m with family it’s a must-do! I feel very weird that all of these started with “I”. Do you crave sweet or salty snacks? What is your favorite photography prop or tool? What software do you use to edit photos? Which meal of the day is your favorite (a) to eat (b) to cook? What vacation destination is on your travel list? I would like to thank Valerie again for believing in my blog and congratulations to her as well! Happy blogging! Love it! I only did not already know #8, well and 11. And when do you ever get to do #6? Haha! #6 … It’s been known to happen once or twice. I don’t get to stuff my face with movie popcorn for a few years now! Thank you so much for nominating me! I’m going to have to put some serious thought into my responses and who I might nominate!! !